“I will not read any of your books,” a reader wrote some months back when I presented my views about the not-so-hidden-agenda that drips from Hollywood. But after I spread some salve on the scratches of my ego, I realized this person was flagging the trophy of democracy— including freedom of speech. When I stood in that courtroom over thirty years ago, I lifted my right hand, and tears of gratitude trickled as I pled my allegiance to the United States of America. Becoming a United States citizen was an honorable vow, a commitment and a promise that America would from then on hold my allegiance and my respect. American freedom graced my life like a treasure. Not a freedom to indulge my own gain and desires, but a freedom that required responsibilities. Moreover, the realization that responsibilities call for commitment. Commitment requires courage. Courage begs wisdom. Wisdom requires truth. And upholding truth demands action. Sadly, this writer believes we’ve taken action. But not toward upholding the freedom this country was founded on. But to freedom that is slowly opening the door to a prison of moral destruction. We have the freedom to paint TV and theatre screens with vulgar scenes, words, and examples of behavior that ridicule God’s precepts. That freedom we do have. But will we have the courage to face the consequences? Pushing God out of our courtrooms, schools and public entities does indeed shout freedom of speech. But do we have the commitment and diligence needed to pick up the pieces of a country veiled with darkness in the absence of God? 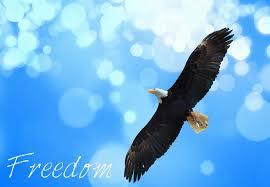 Freedom includes wisdom—not our own, but that of our creator. The same wisdom that fueled the founding fathers to birth a country that rose to be the most powerful and prosperous in the world. But that prosperity, rather than evoking gratitude, brought false confidence and pride. It masked values and opened the door for discontentment, criticism and a free-for-all for financial gain at the expense of innocent eyes and ears. Freedom of speech is like pouring rain—it can moisten parched land, or cause destructive floods. And flooded we have become with distorted values, and violence that fills our kid’s minds excused as acceptable, lyrics that sing of horrific actions blaring over radio stations, even groceries stores displaying magazines that celebrate sin with luring headlines is as common as milk on the shelves. Admirably, some parents still fight the battle, attempting to instill truth and morals in their kids. But when did freedom of speech become the enemy making those efforts more difficult every day? We have freedom of speech handed to us. But do we have the valor to stop its abuse, to make a stand before we drown in the murky waters of sexual decadence? Like a frog in boiling water, we won’t realize its destruction until entertainment dripping with violence and blatant depravity cooks our conscience. To the lament of most, that coveted freedom would then be but a distant desire. Father, we need wisdom to seek you, your ways, your laws, your precepts and your freedom. Grant us a humble spirit to recognize without you, darkness awaits. But with your hand guiding, victory is ours. In Jesus’ name, amen. Will you join in prayer for America? BEAUTIFULLY WELL SAID, JANET. GOD BLESS YOU!